Finally got there. Now, remind me never to attempt a 'strip planked' project, way too tedious... And I've still got to remove all the staples! Having used up the last of my epoxy it was time to try another brand. So far I've used SP106 and West Epoxy. SP106 was very good if a little too viscous for ease of wetting out g'fibre fillet reinforcing and West was better in this respect but always set with a waxy finish, irrespective of shop temperature. I chose MAS FLAG (filleting, laminating and glueing). Great service from the supplier, ChinaWind Yachts, arriving within 3 days of placing the order. It's quite viscous and reminded me of SP106 in this respect. They do a low viscosity resin for sheathing and I'll definitely be trying that when the time comes. There is one small problem using 9mm for the bottom of the hull and 6mm for the sides. What to do when both panels become coplanar and your plating material is 6mm. 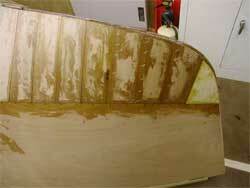 I have chosen to gradually thin down the strips forward of the chine transition notch. Mike's planner/thicknesser made this an easy task and each strip looses 0.020" such that the last piece is exactly 3mm thick and the two panels blend seamlessly. 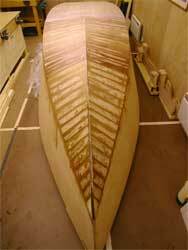 Time to let the epoxy cure while I design and order the propeller shaft and the timber for the stem & keel.